Provides convenient wireless connectivity for your home. Lets you share Internet service. Wireless-G is the upcoming 54Mbps wireless networking standard that's almost five times faster than the widely deployed Wireless-B (802.11b) products found in homes, businesses, and public wireless hotspots around the country - but since they share the same 2.4GHz radio band, Wireless-G devices can also interoperate with existing 11Mbps Wireless-B equipment.Since both standards are built in, you can protect your investment in existing 802.11b infrastructure, and migrate to the new screaming fast Wireless-G standard as your needs grow.The Linksys Wireless-G Broadband Router is really three devices in one box. First, there's the Wireless Access Point, which lets you connect Wireless-G or Wireless-B devices to the network. There's also a built-in 4-port full-duplex 10/100 Switch to connect your wired-Ethernet devices. Connect four PCs directly, or daisy-chain out to more hubs and switches to create as big a network as you need. Finally, the Router function ties it all together and lets your whole network share a high-speed cable or DSL Internet connection.To protect your data and privacy, the Wireless-G Broadband Router can encrypt all wireless transmissions. The Router can serve as a DHCP Server, has NAT technology to protect against Internet intruders, supports VPN pass-through, and can be configured to filter internal users' access to the Internet. Configuration is a snap with the web browser-based configuration utility.With the Linksys Wireless-G Broadband Router at the center of your home or office network, you can share a high-speed Internet connection, files, printers, and multi-player games with the flexibility, speed, and security you need! Provides convenient wireless connectivity for your home. Supports the popular Wireless-G (802.11g) standard, and is compatible with Wireless-B devices. Offers transfer rates of up to 54Mbps. Lets you share Internet service. The router permits sharing a high-speed cable or DSL Internet connection among the computers on your network. 4 Ethernet ports let you connect your wired devices, too. Connect your wired desktop computers and network printers to your network. Built-in firewall helps protect your network from online threats. Wireless encryption helps protect your data and privacy. Easy to set up. Configuration is a snap with the browser-based configuration utility. Learn about the iconic WRT54GL wireless router, offering professional-grade home networking with customizable, Linux-based open source technology. The iconic WRT54GL wireless router offers professional-grade home networking with customizable, open-source technology. 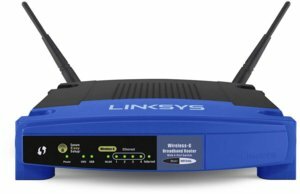 Add computers, printers and other wireless devices to your home network at speeds of up to 54 Mbps.